A best selling Japanese manga, a hit anime and now One Piece looks to make an impact on us gamers in One Piece: Pirate Warriors! This is the first time the franchise has come to the HD consoles and with successful anime titles such as the Tales series making good use of higher visuals, will One Piece: Pirate Warriors be the game to truly depict what makes the franchise so popular? Or has this voyage ended before it could even get started? For those who are fans of the series, the overall plot and characters should be pretty well known to you but for those new to it, the world is currently in the age of pirates and a man called Gold Roger is known as its King after having successfully sailed the treacherous waters called the Grand Line. 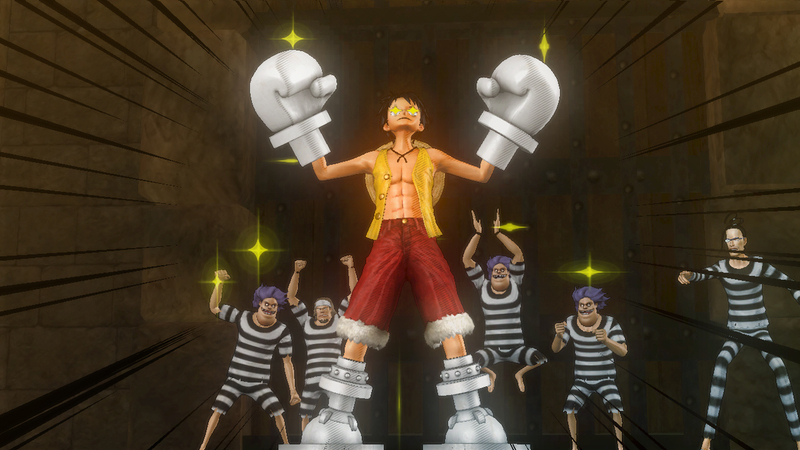 Having being captured by the marines and sentenced to execution, his last words lit the world on fire and inspired a whole new generation of pirates to go out to sea and look for the treasure called One Piece. The man who wishes to be King of the Pirates! One pirate in particular called Monkey D Luffy has set his sights on not just the treasure but also the title “King of the Pirates”. He himself sets sail, recruits crew members and takes part in epic battles on his journey through the Grand Line. Now what the game seems to do here is use cutscenes for the bigger plot turns and a block of text with narration to explain everything else. While this isn’t bad in any case, I felt that important moments such as Luffy meeting some of his crew members were missed out and even worse, not every battle is featured in the story even though they are pretty significant to the overall plot. For those who follow the One Piece series, you will automatically notice that many details and events have been left out but for those new to the franchise, this condensed version of the narrative may suit them better in the long run. So in terms of general gameplay, One Piece: Pirate Warriors uses two attack buttons when combined together in different ways, can unleash different results. At the start you only have access to a few moves but as you go through the journey and become stronger, more button combinations will become available to you bringing with it stronger attacks. You can also charge specific attacks to deal more damage. Each character has a special meter which can be used to perform special moves that can deal devastating amounts of damage. Of course this varies from character to character with some having more specials then others however it all works according to the story covered so far. Now this is not the most sophisticated combat system but the use of multiple combinations is something that has been missing from a lot of games of its type nowadays and in essence brings a learning curve to mastering your favourite characters moves. Looks a little painful twisting your body like that right? The AI themselves can prove to be difficult depending on the difficulty you’re playing on however I would have to say the more difficult bouts came around when facing the actual bosses who can put up one heck of a fight. Even in saying this, there isn’t much to taking on the 100+ enemies that come at you at once but I’d have to admit that it’s pretty cool to send them all flying at the same time. Among the regular minions are their leaders who show a little more spirit compared to the standard soldier but even they can be taken down with ease. 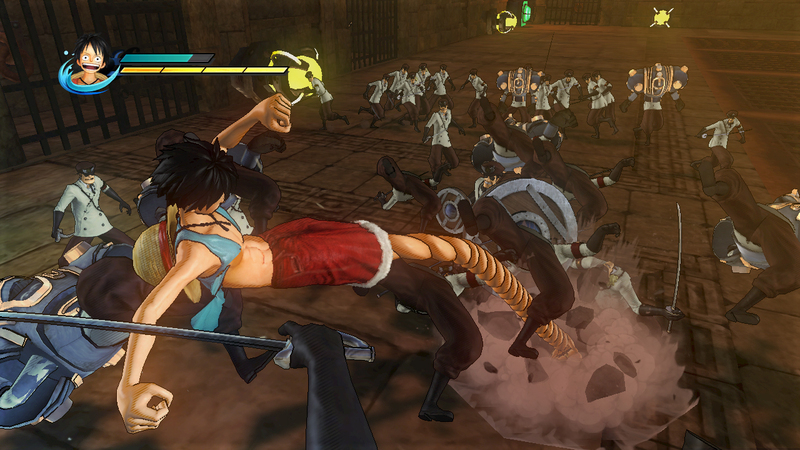 The main mode here is the Main Log where you can play through the One Piece story as Monkey D Luffy but along the way, you will be required to use different characters for different segments. In total there are (number) of episodes with each offering a different type of gameplay and challenge. 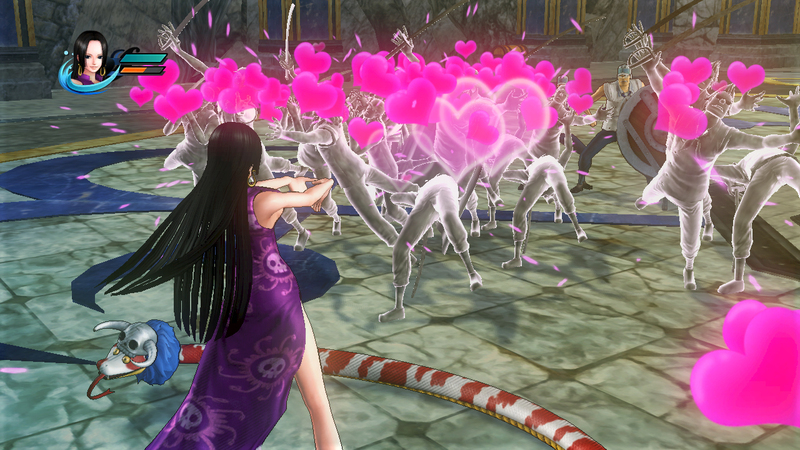 The three types are Action, Musou and Boss battles. Musou stages comprise of you taking on what seems like endless amount of enemies in an environment that has been split up into territories. Each territory has their leader and once he is defeated, that area is deemed captured and you’re local allies will appear to hold it down. Once the required amount of areas is captured, the main boss will appear and needs to be taken down. I like the idea here of moving around and actually exploring the environment however it’s done a few too many times and honestly becomes a little tiresome. What they seem to do to keep things interesting is throw in little missions you can complete to earn extra points at the end. These missions vary from helping a fellow crew member defeat an enemy or clearing out an area in a certain amount of time, giving a little more than just destroying every enemy on the map. Some of the most awkward and most useful abilities you will ever see. Action areas are pretty similar to the Musou stages, the only difference being that at certain points you need to perform certain actions in order to advance. This can vary from quick time events to using objects to reach new areas. There is a lot more flexibility this time however as there are no conditions to meet and no territories that you have to capture so go all out, send as many enemies flying as you want and just reach the end. Boss Battles are quite simply what they are and are used to highlight key encounters with certain characters in the story. This involves you going one on one with the boss in an arena type of environment which gives you enough breathing room to attack, defend and make your strategy. While there is the general slugfest, they added a little more interactivity to the battles through QTE’s and making use of your actual surroundings to gain that victory e.g. spitting water at Crocodile so his sand hardens. Even in saying this, the battles themselves don’t seem to be very immersive and I don’t feel that I am indeed taking part in an epic bout just as it seemed to be in the anime. While I like how they kept true by keeping the finish the same way, I still feel that they are yet to find the right balance when it comes to moments such as this. 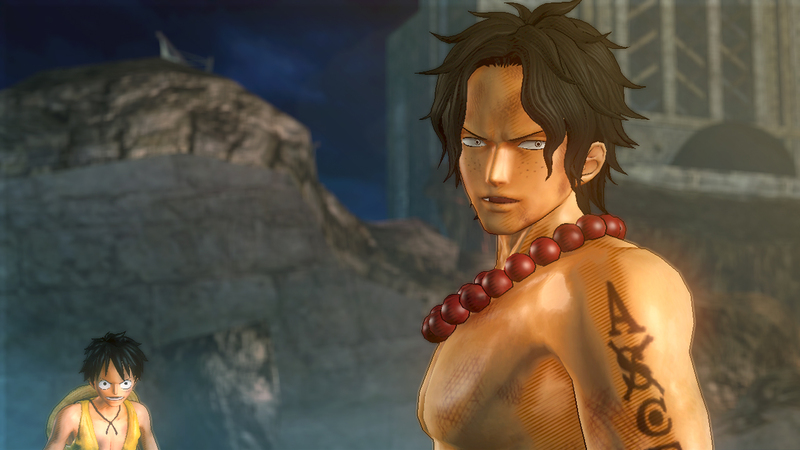 One Piece: Pirate Warriors also uses a sort of level up system in which at the end of every level you receive points based on how well you did. This could be made bigger depending on how many enemies you defeat or how many challenges you successfully complete during that stage. Along with this you can earn skill coins featuring the many different characters and insignia. These can be equipped to each characters treasure pocket with each granting different effects such as boosts in attack and defence power. When I found out the One Piece: Pirate Warriors included an online mode, I was completely overcome with joy at the thought of being able to battle against friends across the world as Roronoa Zoro or Sanji, however I was gravely disappointed as the online mode is simply a co op tag on which allows you to play any level from the main log with someone online. There are no changes whatsoever from the single player version but at the very least it runs smoothly and I rarely came across any lag. The online also uses a level up system but in this case it transfers points into your wanted level instead which acts as your player ranking. In all honestly there could have been a lot more done to the online aspect such as one on one battles or even crazier, team matches! Instead it seems to have just been thrown together at the last minute without any real thought in to creating a meaningful experience across the interwebs. To be honest, One Piece: Pirate Warriors pulls off the visual style of the anime pretty well, essentially diminishing the line between the two mediums. Environments are recreated beautifully and just stand out in their bright, detailed glory. Textures are sharp and every character from the One Piece universe looks and feels just as they should. It is however sad to see that some environments from the story didn’t end up in the finished game such as Skypiea and Thrillers Bark as they would have probably looked amazing as well. Special character animations looked great also although I did encounter the odd camera glitch with Nami’s special move where you can’t see the character at all until the move was finished. Characters look great and very anime like. Voice acting is done brilliantly and every line is pulled off really well whether it’s the more serious moments such as Marineford to the Strawhat crew just goofing off. If you’re a fan of the English dub, sorry but there is no option for that in the game however subtitles are provided. Background music is also done well as most just increase the adrenaline while you are laying the beat down on 100 enemies at once; a good mix of jazz and rock which is pretty much what you hear during those high moments in the anime. While there areas for improvement, One Piece: Pirate Warriors is a good first showing for the franchise on the HD consoles. 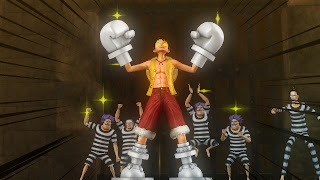 Yes the gameplay can get a little repetitive and the combat is not entirely sophisticated however what’s really important here is that the feel and atmosphere of One Piece has been retained through its characters, voice work and great background music .It may not be the perfect journey everyone was expecting but I’m excited to see what they come out with next.